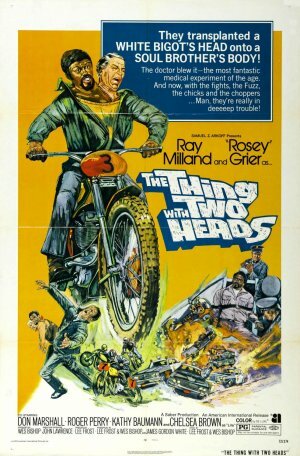 For the uninitiated there really is a film called The Thing With Two Heads. 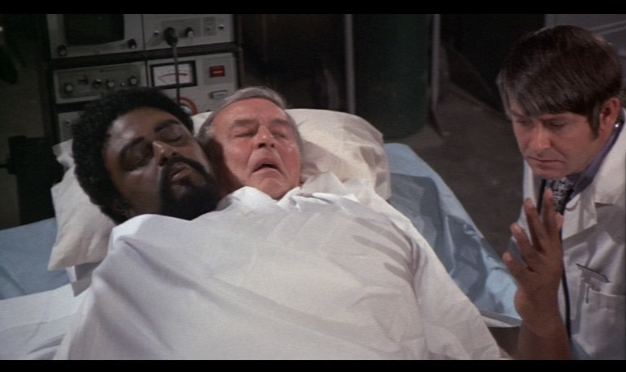 Secondly it actually stars previous Oscar winner Ray Milland in what I like to refer to as his crotchety years. I say this because practically any film he appeared in post 1970 he just seemed to be angry at the world and all in it. From AIP and Samuel Z. Arkoff comes this crazy tale with a fantastic looking film poster to prominently display in the lobby of any proud theater circa 1972. Wheelchair bound Milland plays a world renowned scientist who specializes in the transplanting of organs to save lives. Behind the scenes at his home he has taken the head of one gorilla and grafted it onto another. 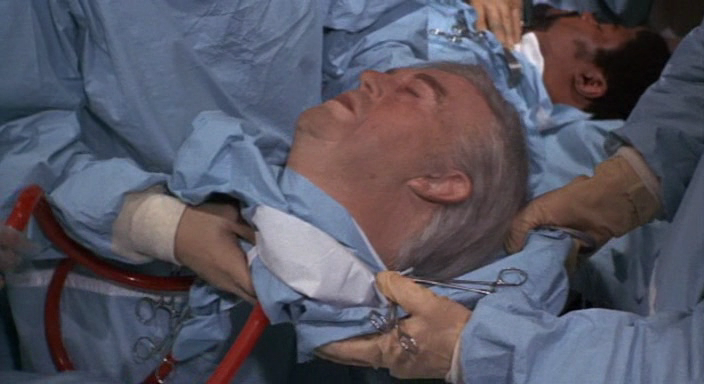 Eventually he will remove the original head thus completing the transfer of one head to a whole new body with the intention of sustaining life. Shortly into the film we find out that Ray is racially challenged. 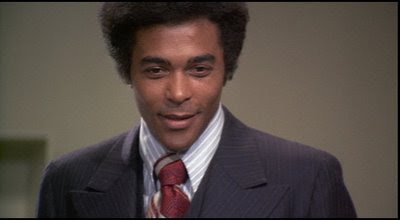 When he realizes that Don Marshall is now on his staff the insults began to fly revealing just how bigoted Ray is. This Ray says to Roger Perry. It turns out that Ray is at an advanced stage of cancer and wants Perry to secure a body that is brain dead that he can graft his own head to and finally remove the existing one. Perry sees the possibilities and the scientific importance of such a medical miracle and finally agrees to perform the operation. When a body can’t be located he turns to death row inmates who might be willing to donate their body to science. The ultimate joke on Ray is about to take place. 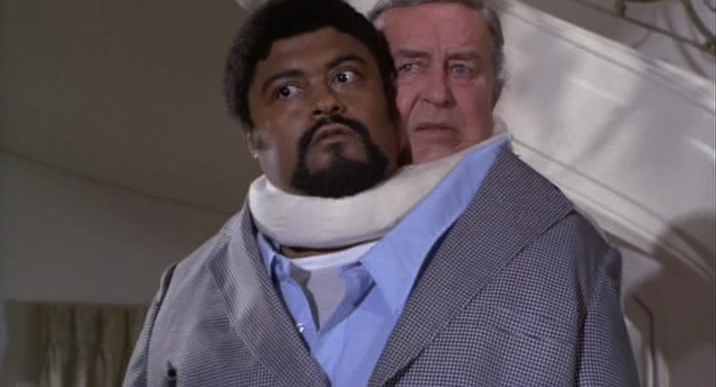 Volunteering for the job is Rosey Grier who despite escaping the electric chair claims his innocence. By consenting to an experiment he’s buying another 30 days in the hopes of his lawyer uncovering the real killer he took the fall for. When Ray awakes and Perry sheepishly explains they had to make a decision on the donor Mr. Milland isn’t very happy with the skin tone of his new look. Too bad the film didn’t just go into a comedy routine from here forward. There are plenty of guilty laughs as Milland bickers with Rosie. Cheek to cheek! Think of how much fun it could have been taking Archie Bunker and attaching him to Fred Sanford! Sadly this just turns into a chase between escaping Rosey/Ray and about 15 police cruisers who surely inspired the likes of John Landis with their crashes as they take on our escaping duo plus Don Marshall on a motorcycle. Marshall has been enlisted at first as a hostage but soon buys into Rosey’s innocence despite that other head trying to bribe him into turning Rosey in and taking some of the credit for this great scientific achievement. Along for the scientific ride we’ll briefly spot tough guy William Smith as one of Rosey’s death row pals and supposedly make up wizard Rick Baker is the man in the double headed monkey suit. The whole point here is to have fun for the first 45 minutes before falling asleep during the car chase used to pad out the films running time. Ray bickering with Rosey and the laughs at seeing a racial bigot awakening to a new body he doesn’t approve of has it’s humor. The fake heads are inept but kind of fun in the longshots when our two leading men aren’t wearing the same suit. Generally I have to assume that Ray is standing on a ladder over Rosey’s shoulder so he can get his head into the same specially outfitted coat for the close ups and verbal sparring. And what’s not to like when Ray puffs on a cigarette and Rosie exhales while trying to eat. Strictly a drive in classic with some fun Ray and Rosey clips but strangely kind of dull overall. “Don’t be smokin’ that thing while I’m eatin!” That line from Rosey still cracks me up. Benny Hill! There’s a show to recall. Great memories there with Archie and George Jefferson. Regular TV is just too scared to put characters like them and Fred Sanford on any more.